Francis Aubuchon, 90, venerated a relic of St. Peter Claver at the Shrine of St. Joseph in St. Louis. Aubuchon is the oldest descendant of Ignatius Strecker, whose cure of an injury was accepted as a miracle for the canonization cause of St. Peter Claver. Strecker prayed at St. Joseph for Peter Claver’s intersession and was considered cured of his injuries and illness a few months later. Dianne Chitwood gets goosebumps thinking about a Vatican-authenticated miracle that is part of her family heritage, one that brings family members together to celebrate each year at the Shrine of St. Joseph just north of Downtown St. Louis. “I feel special. How is my family so fortunate?” Chitwood said March 10 following a Mass at the shrine attended by about 60 Strecker family descendants. Ignatius Strecker — Chitwood’s triple-great grandfather — was a German immigrant living in St. Louis in the mid 19th century. Strecker’s cure of injury and illness was accepted as a miracle for the canonization cause of St. Peter Claver, a 17th-century Spanish Jesuit who ministered to black slaves. The miracle occurred 155 years ago at what is now the Shrine of St. Joseph in north St. Louis. Descendents of Ignatius Strecker gathered together for Mass in commemoration of the miracle that led to the canonization of St. Peter Claver. The Mass was held March 10 at the Shrine of St. Joseph in St. Louis. According to notes from the old parish, Strecker came to America from Germany and settled in what was then St. Joseph Parish, staffed by Jesuits. Strecker, who was devoted to his faith and family, was seriously injured in 1861 when he accidentally struck his chest sharply against a pointed piece of iron at a soap factory where he worked. A tumor-like inflammation began to grow, and he developed symptoms of tuberculosis. A fever set in, his breathing became difficult and he couldn’t eat. He was told he had two weeks to live. A parish missionary, Jesuit Father Francis Xavier Weninger, gave a sermon at St. Joseph on Peter Claver’s intercessory power with God. After the sermon, he blessed the people with a relic of Claver. A few days after the blessing, Strecker returned to work. The breastbone and ribs healed rapidly and the tuberculosis disappeared — all within a couple months. His doctors recognized the cure, and there was never any relapse. The miracle was authenticated by the Vatican in 1887 and St. Peter Claver was canonized in 1888. Chitwood, now a parishioner of St. Theodore Parish in Flint Hill is a member of the Friends of the Shrine of St. Joseph, a group dedicated to preserving the historic church. 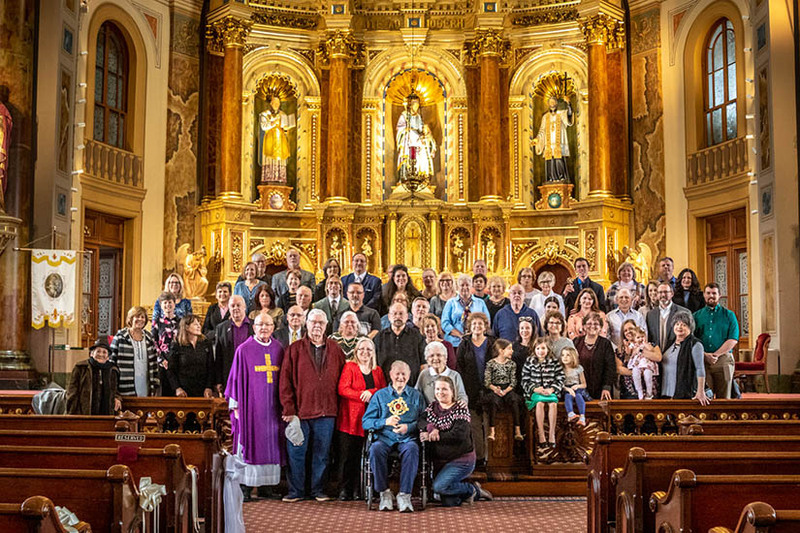 His nephew, Brian Niehaus of St. Gianna Parish in Wentzville and six generations removed from Strecker in lineage, said that the descendants have four relics of St. Peter Claver, obtained by Strecker’s granddaughter, who is his great-great grandmother. She brought the relic to nursing homes, hospitals and other places, reaching 400 people in all, with several attributing cures to it. Brian Neihaus recently restarted that ministry, bringing the relic to his parish and elsewhere, including, he said, to a woman whose tumor in her kidney shrank 90 percent after venerating the relic. “I wanted to show the world we all need healing and love,” said Brian Niehaus, a sophomore at St. Charles Community College. “Obviously, the Holy Spirit put this in my heart, and since this is my relative it’s my duty now,” he said. Steve Crump, great-great grandson of Strecker, said family members recognize the significance religion has in life. “My family is fortunate to be connected to this,” said Crump, a member of St. Catherine Laboure Parish. A Mass on Sunday, Oct. 27, will mark the 175th anniversary of the Shrine of St. Joseph, 1220 N. 11th St. just north of Downtown St. Louis. St. Joseph Parish was founded by the Jesuits in 1844 to serve a residential area of German immigrants and was run by the order for 123 years. The current Shrine of St. Joseph, which used the original church as the vestibule, was built in 1865. When the church was in decline and in danger of being razed in the 1970s, a lay group mobilized a grass-roots effort to restore the church. In October 1980, Archbishop John L. May entered a five-year renewable lease with the Friends of the Shrine of St. Joseph calling for the shrine to remain in use for Catholic services with liturgical control retained by the archdiocese. Labor union members, some Catholic and some not, have been a big part of the restoration. An architect, Ted Wofford, has been one of the volunteers. Especially when renovation was initiated, people of all faiths came to support it, including a Jewish man who grew up in the neighborhood and donated $100,000. Father Dale Wunderlich, rector of the shrine, has said the church is now a place of pilgrimage. The main altar, called the Altar of Answered Prayers, was built in 1867 by grateful parishioners who credited the intercession of St. Joseph with sparing many lives during a cholera epidemic. Mass is celebrated at 11 a.m. Sundays. For more information, visit www.shrineofstjoseph.org. A native of Spain, young Jesuit Peter Claver left his homeland forever in 1610 to be a missionary in the colonies of the New World. He sailed into Cartagena, a rich port city in Colombia. He was ordained there in 1615. By this time, the slave trade had been established in the Americas for nearly 100 years, and Cartagena was a chief center for it. Ten thousand slaves poured into the port each year after crossing the Atlantic from West Africa under conditions so foul and inhuman that an estimated one-third died in transit. Although the practice of slave-trading was condemned by Pope Paul III and later labeled “supreme villainy” by Pope Pius IX, it continued to flourish. As soon as a slave ship entered the port, Father Claver moved into its infested hold to minister to the ill-treated and exhausted passengers. After the slaves were herded out of the ship like chained animals and shut up in nearby yards to be gazed at by the crowds, Father Claver plunged in among them with medicines, food, bread, brandy, lemons and tobacco. With the help of interpreters he gave basic instructions and assured his brothers and sisters of their human dignity and God’s love. During the 40 years of his ministry, Claver instructed and baptized an estimated 300,000 slaves. Father Claver’s apostolate extended beyond his care for slaves. He became a moral force, indeed, the apostle of Cartagena. He preached in the city square, gave missions to sailors and traders as well as country missions, during which he avoided, when possible, the hospitality of the planters and owners and lodged in the slave quarters instead. After four years of sickness, which forced the saint to remain inactive and largely neglected, he died on Sep. 8, 1654. The city magistrates, who had previously frowned at his solicitude for the black outcasts, ordered that he should be buried at public expense and with great pomp. St. Peter Claver was canonized in 1888, and Pope Leo XIII declared him the worldwide patron of missionary work among black slaves.